​Liverpool goalkeeper Alisson Becker has said the Reds fans can spur his side on to victory against Bayern in the last 16 of the Champions League, as he sat down for a chat, and a jam, with local musician Jamie Webster - the man behind the 'Allez Allez Allez' anthem. 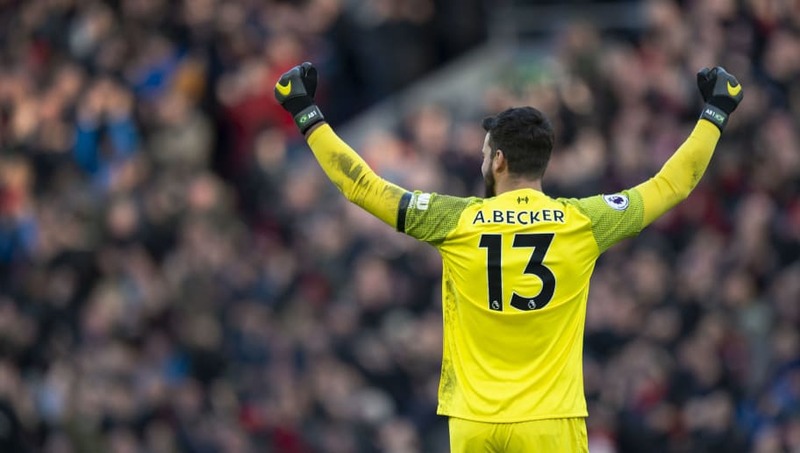 Alisson joined from Roma in the summer, and his immediate impact has been widely felt as the Reds mount a Premier League title challenge with the best defence in the division so far. With a crucial tie against ​Bayern on the horizon, the Brazilian spoke in impassioned terms about the Anfield support, saying that such a vociferous backing really makes a difference as a player. “The supporters are a great part of this team," he said in the ​session with Webster, via the Reds' ​YouTube channel. "They cannot go to the pitch and play but they can do something to move us, to charge us to do something more on the pitch. “It’s difficult to play against ​Liverpool. The quality of the team is amazing. And then the 12th player, outside the pitch, that is the supporters. “Last year, I can remember about the semi-finals that they played against us, it was difficult. It was an unbelievable atmosphere. It was incredible"
Webster, a local electrician who is famed for his Boss Nights and fan anthem 'Allez Allez Allez', took the opportunity to jam with the Brazilian when they met 'in session,' with the keeper even providing some exquisite backing vocals in the chorus - because there's nothing he can't do apparently. The Liverpool number one even agreed to gig with Webster, if Liverpool win the Premier League title. On the subject of the title challenge, meanwhile, Alisson says something special could be on the horizon - but only if everyone can keep their eyes on the prize. “We are excited about battling for the title. We are very focused on this. We are doing this for the supporters, for the manager, for us and for everyone who is inside the project," he said. “This team is different. I think we can do something special here. But we need to put the feet on the ground and keep working, working, working."